THE GOLDEN AGE OF MUSIC VIDEO is partnering with VEVO to curate the VEVO.com Throwback Thursday Guest Playlist with our music video picks! This week we celebrate a special Thursday because tonight is the Rock and Roll Hall of Fame induction ceremony in Brooklyn, New York. 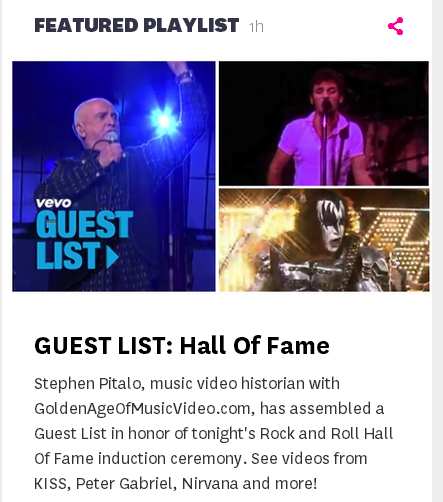 Take a look at our list, located on the front page of VEVO.com , where you’ll see music videos by this year’s inductees including the E Street Band (with Bruce Springsteen), Nirvana, Hall & Oates, Kiss and Peter Gabriel.